You know, I think about these all week, and every Friday sneaks up on me. We are in birthday party mayhem around here. I think I am going to start fazing out the birthday parties. We went to every other year a couple years ago, but this three in six weeks right after Christmas is really causing me some stress. Of course, I am taking the easy way out this year. Nothing is at the house. This means things are more expensive, but all I have to do is show up, slap down some cash, and then I can chat it up. Super easy. But not cheap. I don't do New Years resolutions, but I am trying to stay within budget, which is quite difficult on one income and with five kids. But I have some strategies worked out. Like when we absolutely MUST get to the store, I wait another two or so days. This forces us to really eat out of the pantry. And then when I return from the store there is such jubilation at the marvel of food that it lightens the whole mood. Like everywhere, it was cold here this week as well. Of course there is the curse of the internet: amazon. I have a love hate relationship with this place. I love the convenience of getting what I need or want in two days. But then I get that blasted credit card bill and I am like: "Oh good gracious! What in the... how did I... whoa!" We are planning a rummage sale for LMCA in the Spring and going through stuff has really helped me to see that we have so much more than we need. I am sure we aren't the only ones. Someone chime in and tell me I am not walking this road alone! 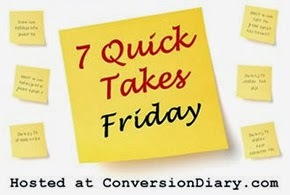 Check out what others are blogging about over at Conversion Diary and The Pebble Pond. Jessica: one of the good things about the upcoming foot surgery is I cannot go out shopping and yes, I am on a crusade to get rid of the extra stuff we have and really don't need. Hang in there!